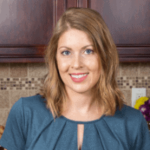 Published: Dec 12, 2014 · Modified: Oct 24, 2018 · By Jen Sobjack · This post may contain affiliate links. This Orange Cranberry Biscotti is a flavorful and festive holiday treat. Full of orange flavor dotted with cranberries, and drizzled with white chocolate goodness! I am a sucker for sweet, crunchy biscotti. Especially around this time of year. And when there’s orange and cranberries in the mix, I simply cannot say no. 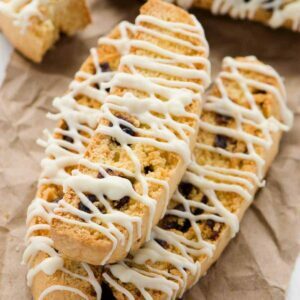 This recipe is one that I developed last Christmas and it has become my favorite biscotti recipe. The ingredients for my biscotti are simple. You have the usual: flour, salt, leavening, eggs, sugar, and oil. More than likely you already have these ingredients in your pantry. This particular recipe calls for orange extract and dried cranberries. However, you can flavor the base any way you like. The recipe makes around 25 cookies. It’s perfect for portioning out into little gift bags for the holidays. This orange cranberry biscotti is actually my favorite thing to package and mail to family. My mom loves getting homemade cookies in the mail. She’s always so grateful and appreciative of the love and effort poured into those types of gifts. 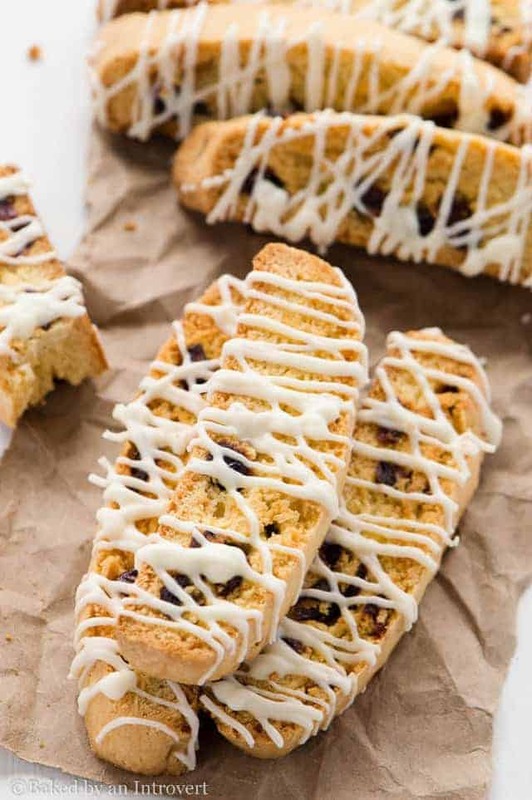 I mean who wouldn’t love orange cranberry biscotti drizzled with white chocolate! The most flavorful and festive holiday biscotti. Full of orange flavor dotted with cranberries, and drizzled with white chocolate goodness! Preheat the oven to 375ºF degrees. Line a baking sheet with parchment paper. In a medium bowl, cream together the oil and sugar. Beat in the orange extract and eggs. In a separate bowl, combine the flour, salt, and baking powder. Slowly add the flour mixture to the egg mixture. Mix just until dough forms. Stir in the cranberries. Shape the dough into two 12x2 inch logs on the prepared baking sheet. Press down to about 1/2 inch thick. Bake for 25-30 minutes or until lightly golden brown. Allow the logs to cool enough to touch. Slice into 1/2-inch diagonal slices. Lay each slice cut side down. Return to the oven for 10 minutes longer or until lightly toasted on each side. Cool completely on a wire rack. Combine the oil and white chocolate in a microwave-safe bowl. Heat for 45 seconds. Stir until chocolate is completely melted. If needed, heat longer in 10-second intervals. 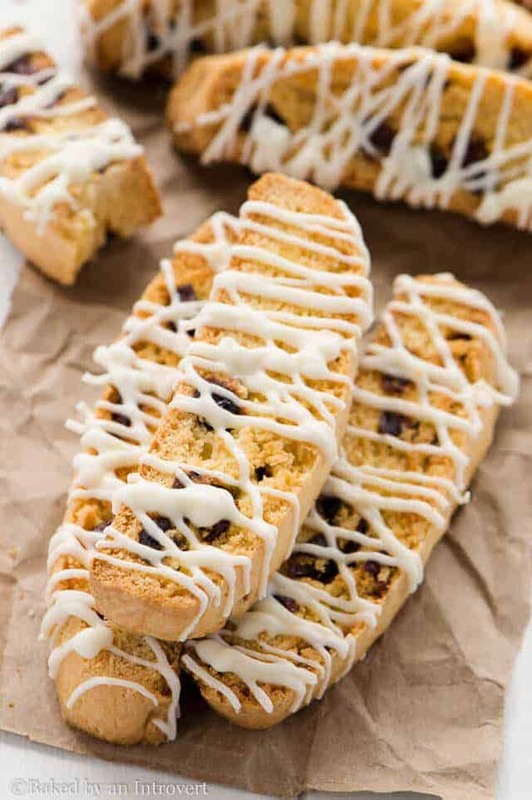 Use a spoon to drizzle the white chocolate over the biscotti slices. I think this is the third year I have been making this awesome biscotti. I make a ton, of different biscottis. These are one of my favorites! I always made these without the frosting but this year I did the drizzle. It took them over the top. What a great recipe ! Hi Jen, Thanks for the recipe! Can you use coconut oil in place evo? I’ve never tried to make the recipe with coconut oil, but I don’t see why that should be a problem. Let me know how it turns out! Thanks, Jocelyn! It was quite amazing. Absolutely, Mj. You can use equal amounts of zest in place of the extract. And you could toss in an equal amount of juice for good measure. 😉 Enjoy! Thanks! I’m going to give them a go! I can’t think of a better recipe that encaptures Christmas than these biscotti! They look SO festive, delicious and fun! A perfect recipe I must make this holiday season. I love biscotti! Cranberry Orange is a favorite combo flavor of mine as well! Especially this time of year! YUM! You will really like this biscotti then, Amber. I couldn’t stop eating it. I love biscotti especially during this time of year! I haven’t made any this year yet and your orange cranberry ones are definitely going on my list this weekend! They look incredible! Thanks, Kelly! It’s the perfect holiday cookie. I hope you get to try it! My mom loves biscotti and I make it for her as a gift all the time. I definitely have to try this flavor, I love cranberry and orange together!! YUM. You are too sweet, Sarah. Thank you so much! Loveeee biscotti, have a dozen lying around my kitchen right now! These look amazing Jen, pretty and festive! 🙂 Pinned. 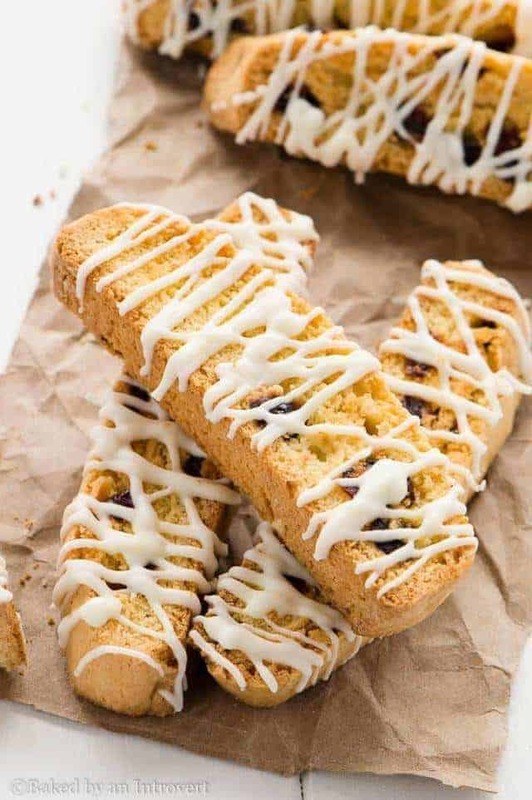 I love biscotti around the holidays, too! So delicious and perfect to dunk into my mug of coffee or hot chocolate. I love the orange cranberry combination, Jen! And the drizzle looks perfect! Such a fun holiday cookie. Pinned! Thanks, Gayle! Dunking biscotti into coffee is the best!